Attacks on Sufi shrines in Pakistan and Afghanistan: Why this Narrative of Denial in Urdu Media? Sectarian violence is a widespread phenomenon in Pakistan. For a decade, most terror attacks of sectarian nature occurring in Sindh and Baluchistan–the two most vulnerable provinces of Pakistan–were targeted against the two particular Islamic strains: Sufis and Shias. Not a single day passes without an attack on the two religious minorities and their mosques and shrines in these provinces. Not to talk of the Sufi shrines or Shiites’ imam barahs, even the houses where they perform their certain religious rites are set ablaze. In the last Islamic month of Muharram, sectarian terrorists targeted several Shia women, children and men who were praying at home in Karachi. Similar sectarian tensions were reported from Kabul on Oct 11 when a Shia shrine in the city was attacked on the eve of the 10th Muharram, the most sacred date in the Islamic calendar. The rising scale of sectarian attacks in Afghanistan and Pakistan underline the deadly new dimension that the war within Islam could bring to its decades-long conflict. Recently, Pakistan witnessed the deadliest suicide bombing on the Sufi devotees at the shrine of the Sufi saint Hazrat Shah Noorani, in the provincial capital of restive southern Balochistan. According to the Pakistani Urdu daily Express News, at least 90 people died and more than 100 others were injured in the bomb blast at the remote Sufi shrine in Pakistan. Close to 600 people were praying at the shrine at the time of the attack, according to local official Tariq Mengal. He told Geo TV that many devotees travelled to the site from Karachi during weekends. 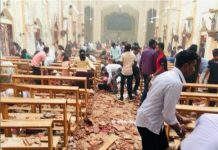 Clearly, the suicide attack was targeted at the Sufi practitioners who were participating in a devotional Sufi session, which is held daily before dusk. The terror attack took place close to where devotees were dancing inside the compound of the shrine, as reported by News18. (news18.com/news/world/52-killed-in-sufi-shrine-blast-in-pakistans-balochistan-1311473.html). In June, 2016 Amjad Sabri, a popular Qawwal (Sufi singer) of Pakistan was assassinated by two Talibani gunmen in Karachi. (Source: dawn.com/news/1266514). The reason why Sufi devotes and Shia minority have been targeted in the continued spade of jihadist atrocities is patently clear. Sufism or Shi’aism are lambasted as deviation from the ‘puritanical Islam’. Sufis and Shias are declared heretics and apostates ‘whose blood should be shed to purge Islam of the deviations’. This is the religious justification for the sectarian killings underpinned by the theological masters of all the extremist Islamist outfits, be it the ISIS, al-Qaeda or Tahrik-e-Taliban Pakistan (TTP). But news media in Pakistan continues to spread a complete narrative of denial and thus helps the extremist cults further their nefarious sectarian ends. With liberal space rapidly shrinking in Pakistani press, there seems to be an influence of sectarian ideology in the country’s media. Instead of candidly exposing the sectarian factors behind the suicide bombings at the Sufi shrines like the Shah Noorani Dargah, a large section of the Pak media, particularly the Urdu press diverts the issue from the real case. Some of them even make a mockery of the Sufi denomination, blatantly emboldening the sectarian war-mongers in the country. A fatwa-factory declaring the Sufi practices as ‘Haram‘ (forbidden in Islam), ‘Bid’at’ (un-Islamic innovation) and ‘Mushrikana Rasm’ (heretical practice) can be seen in the mainstream Urdu media in Pakistan, let alone the social networking sites. This is how the country’s Urdu media is radicalising the common Muslim viewers and readers who are already influenced by the sectarian tendencies. After every sectarian terror attack in the region, the run-of-the-mill conspiracy theories make headlines in the prominent section of Pakistani media. Rather than a candid exposition of the violent sectarian ideologies and extremist takfirist thoughts, most media outlets shift the entire blame to the ‘secret agencies’ of its rival country. In an attempt to misguide the common perception in the county, a large section of the news media in Pakistan blames the Indian intelligence agencies, particularly RAW, for not only common terror attacks but also the sectarian strife and suicide bombings. One wonders how an Indian intelligence agency can recruit the Pakistani suicide bombers indoctrinated into the violent jihadism luring to heaven and Houris? This is nothing short of the brazen violation of the journalistic ethics in the Pak press which is not ready for an unbiased portrayal of the facts. Needles to say, News Media’s first allegiance should be to an objective and truthful journalism not to sectarianism or the fabricated version of ‘nationalism’. But turning a blind to the dangerous sectarian ideologues in Pakistan in a bid to blame the Indian agencies shows that Pak media is serving neither ‘journalism’, nor even ‘nationalism’. Thus, the Urdu news media in Pakistan seem to have rescued the real culprits–the fanatic religious goons of Pakistan indoctrinating Muslim youth into a sectarian ideology resulting into the suicide bombings at the Sufi and Shia shrines. Pakistani media’s portrayal of the sectarian suicide bombings is quite distressing, but it is not unusual. Most Pakistani news media, Urdu newspapers in particular, are not yet ready to call spade a spade. It cannot be denied that the Shah Noorani Shrine suicide bombers were the jihadist terrorists who abound in Pakistan. But it is nowhere unplugged in the news reports, stories or even in commentaries in Pakistani press. So does the Pakistani press purport to state that it was also a handiwork of the ‘foreign fighters’? This reminds us of a similar narrative of denial that was propagated in the Pakistani media in the wake of the infamous Uri attack. Much in the same way, most media outlets in Pakistan accused the Indian state of staging an attack on the Indian army in Uri. They popularized an unfounded theory that the Uri attack was an “inside job” by the Indian government in order to “divert attention from the Kashmir issue”. Pakistan’s major Urdu newspapers, most notably Jang, Express, Khabrain, Nawa-e-Waqt, Daily Pak, Daily Ausaf, Jasarat among many others, buttressed only one narrative in the Uri attack: It was an “inside job”. Such a sweeping blame-game dressed in the form of news and commentary has been consumed by millions of Pakistani readers and viewers. “This is a double-standard journalism in Pakistan which views everyone sloganeering for the Kashmir freedom as Mo’min (faithful) and those calling for freedom in Baluchistan as “Kafir” and Dushman-e-Islam (disbelievers and enemies of Islam). Pak media and press can only see the plight of Kashmiri people, but it turns a blind eye to the blood of innocent people being shed daily in Baluchistan, which has become a big battleground now. Around 500 civilians have been killed in several explosions at the Sufi shrines, Dargahs, hospitals, academies and schools during the last three months. But Pak media refuses to see the Tahrik-e-Taliban, Sipah-e-Sahaba and Lashkar-e-Jhangvi behind these atrocious attacks. It can only see the hands of Indian agencies in the wake of every terror incident”. Keeping in mind that news media in Pakistan works under rigorous government pressure and other obvious constraints, one can understand why the fourth state of democracy is losing its grounds in the country. Regrettably enough, assassination attempts upon writers and journalists are shockingly common in the country’s history of journalism. Not only the government, but also its agencies as well as extremist Islamist militants have an easy and acute grip on the media persons. Given this situation, if a media outlet in Pakistan tries to portray the grounded ideological realities in the country, it would be great journalistic courage of conviction in sincere service of the nation, people and the misconstrued religion. At a time when most media outlets are busy actively reporting the propaganda and disregarding the facts, a bold move in the Pak journalism is a desperately needed to rescue the country’s ethics of journalism from the onslaught of sectarianism.